I’ve been thinking about this press release issued by Colonel Blanchard that has the skeptics in such turmoil and I must confess worries me a bit as well. There just doesn’t seem to be any logic in it if we start with the premise that they thought they were finding parts of an alien spacecraft on the debris field. But as I was driving across Nebraska, which is fairly boring, I got to thinking about this and what the press release actually said. The terminology is important and the lack of any real detail is also important. If we look at what was said about what was found on the ranch managed by Mack Brazel and what was seen by Jesse Marcel, Sr. and Sheridan Cavitt, we might be able to figure some of this out. Roswell, N.M. – The army air forces here today announced a flying disc had been found on a ranch near Roswell and is in army possession. The Intelligence office reports that it gained possession of the ‘Dis:’ [sic] through the cooperation of a Roswell rancher and Sheriff George Wilson [sic] of Roswell. The disc landed on a ranch near Roswell sometime last week. Not having phone facilities, the rancher, whose name has not yet been obtained, stored the disc until such time as he was able to contact the Roswell sheriff’s office. The sheriff’s office notified a major of the 509th Intelligence Office. The air base has refused to give details of construction of the disc or its appearance. Residents near the ranch on which the disc was found reported seeing a strange blue light several days ago about three o’clock in the morning. According to the best evidence available today, Brazel found a field that was covered in metallic debris a few days before heading into Roswell. He provided almost no descriptions of it but did want to know who was going to clean up the mess. Tommy Tyree, a sometimes ranch hand working for Brazel, explained that the material was so tightly packed that the sheep refused to cross it but that doesn’t tell us much about the density. All we know is that the material, and I’ll guess some of it stirring in the wind, frightened the sheep. There was enough of it to make it a chore to collect. Jesse Marcel, Sr., would later suggest that it was an area that was about three quarters of a mile long and a couple of hundred feet wide. Bill Brazel would talk about a gouge through the center of the area that was a half mile or so long which tells us nothing about the amount of debris but does suggest something about the length of the debris field. 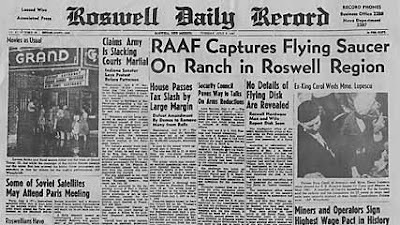 We know, based on the records, that Brazel did drive into Roswell to talk with the sheriff and that the sheriff contacted the Roswell Army Air Field. Jesse Marcel, along with Sheridan Cavitt accompanied Brazel back to the ranch, arriving late in the day. It was too late that night to go out to the field, so they made that trip the next morning according to Marcel. Cavitt, according to what he told Colonel Richard Weaver, went out with Bill Rickett, his NCOIC, and thought that Marcel might have gone out with them (and it is here we see some of the trouble with memories that are decades old). Marcel said that he, Cavitt and Brazel went out the next morning and gathered some of the debris. Marcel said that he told Cavitt to head back to the base and he would stay, though I don’t know why he would have done that. Marcel said that he filled his car with the debris and that he then drove back to Roswell. And here we encounter the beginnings of the real problems. Even if Marcel moved slowly, it shouldn’t have taken no more than an hour to fill his car, and even if he drove slowly back to Roswell, it shouldn’t have taken no more than four or five hours, which would seem to put him in town in the early evening at the latest. Which, of course, suggests that he didn’t have to wake up his wife and son to show them the debris, which, according to Jesse Marcel, Jr., his father called a “flying saucer.” He might have stopped at the house to show them what he had found because it was parts of what he thought of as a flying saucer and for that reason it was mildly interesting. Flying saucer didn’t necessarily mean alien spacecraft at the time, though that was certainly one of the interpretations, one of the least likely of the interpretations, given the tone of most newspaper and radio reports. Now, here is what I’m thinking about this. On July 6, 1947, newspapers around the country carried the story of a flying disk recovered in the Circleville, Ohio area by a farmer, Sherman Campbell. 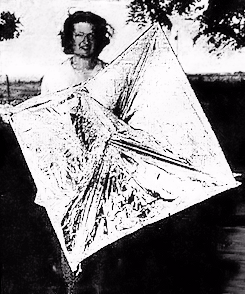 Pictures of it were published in the newspapers, including one with Campbell’s daughter holding up what are clearly parts of a rawin radar reflector. Campbell identified it as did the local sheriff and newspaper reporters. Campbell though if it was high aloft with the wind causing the reflective surface to spin, it might look like a disk from the ground. I don’t know if they saw or heard this story in the Roswell area, but it was national news and it certainly offered a plausible answer for some of the flying saucer/flying disk reports. Some sort of strange metallic debris with a nearly intact radar target had been found in Ohio. This might have suggested something to Blanchard. So Marcel shows up early the next morning (which in the military wouldn’t have been all that early when you remember that flight operations as well as other tasks might start at four or five in the morning) and I would guess somewhere around seven or seven-thirty. According to what he would later say, and given the descriptions of the material recovered provided by Bill Brazel, Loretta Proctor, Bud Payne and Tommy Tyree, there wasn’t much in the way of diversity. They had some light weight wood that had the density of balsa, some wires that Bill Brazel suggested were like monofilament fishing line but that would transmit light, some foil and some parchment. Nothing to suggest an alien spacecraft, only some materials that were sort of familiar but a little bit different and nothing that would suggest any sort of identification. Besides all that, we have Cavitt telling Weaver that it was all a balloon (though Cavitt told me personally in 1991 that he had been too busy in July 1947 to go chasing balloons). Blanchard probably (and note the qualification) looked at the debris, thought it nothing all that extraordinary but would be something that might be associated with the flying saucer stories. As far as he was concerned, there was nothing classified about the material. They hadn’t found a craft. They hadn’t found bodies. There was nothing to suggest that it was a project from White Sands or an experimental aircraft that had crashed. It was just a field filled with metallic debris… strange debris to be sure but nothing that would lead to the conclusion that it was extraterrestrial. If Blanchard was aware of the report from Circleville, that might have inspired him to order Haut to issue the press release. Even if he hadn’t seen that story, he had certainly seen many others. Given the time, that is July 1947, few of the explanations suggested interplanetary craft as opposed to interstellar. Scientists, military officers and government officials were offering their take on the sightings but there was certainly nothing that was classified about it. Blanchard’s message center would have been receiving directions and intelligence about a wide variety of subjects on a daily if not hourly basis but I doubt that much space was wasted on flying saucers in those early days. What this means is that on the morning of July 8, when Blanchard ordered Walter Haut to issue the press release, they weren’t dealing with classified material. They were dealing with some strange debris found by a rancher. They might not have known exactly what it was, but they weren’t thinking in terms of classified material. This explains the press release because it demonstrates that Blanchard was telling the local community they had found elements that might have been part of a flying saucer, whatever that might have meant at that time. And it explains Marcel taking the material home to show his wife and son. In fact, given the nature of the debris, Marcel might not have felt it necessary to report it to Blanchard until the next morning. He stopped at his house, not necessarily to show them the debris, but because it was on his way to the base, the duty day was over, and there was nothing classified or critical in his possession. He could wait until the morning. This would, of course, alter the various timelines created about these events, but it doesn’t change anything radically. All it does is provide an answer for why the press release was issued and why Marcel took the material home to show his wife and son. At that point nothing was classified. That would come later, when additional wreckage was found, but at that precise moment, they were dealing with the mundane and not the extraordinary. "[Colonel] Blanchard Then Told Lytle That An Alien Craft Had Crashed Near Roswell . . . Four Bodies Had Been Recovered"
'Flying Saucer' is Found in New Mexico!